Even the name of this novel gives the hint that this is a mash up of two genres. Modern day police procedural meets Victorian-style ghost story on the streets of (where else?) London. Ghost stories and crime novels seem like a natural fit. And Benedict brings them together reasonably effectively in her second novel. Although, as the title suggests, she is not really sure whether this is a crime novel (about detective Jonathan Dark) or a ghost story (about ghostwhisperer Jonathan Dark). Jonathan Dark is a police detective, on the trail of a stalker who killed his last victim and has moved on to a new target. That target is Maria King, blind since birth but recently given her sight back through surgery. Maria is a mudlark, spending time on the banks of the Thames digging for pieces of old London. She still walks the streets of London with a blindfold, unable to bear the thought of using her newly regained vision. At the same time Finnegan Finch has died after taking part in a deadly game while trying to escape the clutches of a shadowy organisation. Finnegan returns to London as a ghost, helped by his old mate and undertaker Frank. Frank helps the newly deceased come to terms with their spiritual state with the aid of a range of ghostly companions. There is a lot going on in Jonathan Dark. The police investigation into the crazy stalker, a mysterious cabal with its tentacles across London including the police force itself, Jonathan’s relationship with his ex-wife, the rules around ghosts, and a subplot around evil soul sucking spirits. And all of this requires a fair amount of exposition. And while it is handled competently, there is a little too much backstory and information. In the end, as with many crime novels with a supernatural element, the procedural element is almost completely subverted by the supernatural element. It is always much easier to solve murders when you get help from the ghosts of the victims. And this happens across all of the disparate elements of Jonathan Dark. Still this is an atmospheric supernatural thriller with some effective twists that takes readers to parts of London that don’t often get a look in. The final line of the novel is: “Death has no sequel”. But not so crime novels. 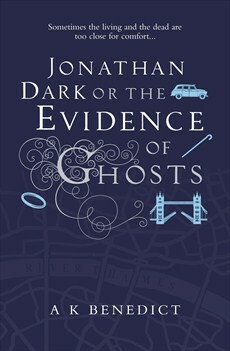 And with all of those rules and backstory out of the way, Jonathan Dark or the Evidence of Ghosts could be the start of another interesting genre mashing series.